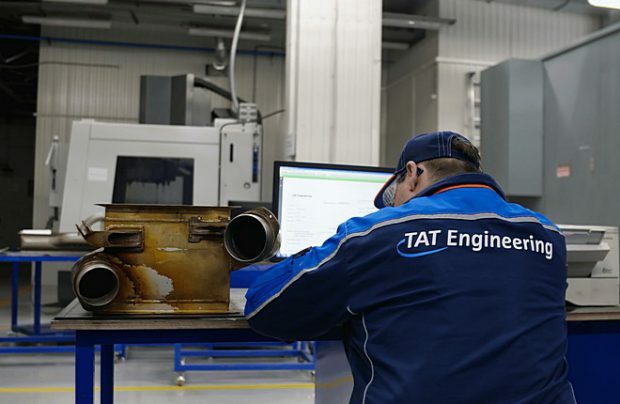 With a view of becoming the leading centre for the MRO of heat exchangers in Russia as well as for the entire former Soviet Union region, TAT Engineering, a joint venture between Russia’s S7 Technics Holding and Israeli TAT Technologies, has passed another EASA’s audit and is targeting the FAA and Russia’s Rosaviatsiya certificates in the future. Established in 2016, a JV, which specialises in the maintenance, repair and overhaul (MRO) of aircraft heat exchanger systems, has successfully passed the European Aviation Safety Agency’s (EASA) annual audit. Following an inspection of TAT Engineering’s production facilities at Novosibirsk’s Tolmachevo Airport (OVB), the company’s Part 145 certificate has been extended for a further 12 months, until the end of May 2019. “We have confirmed that TAT Engineering’s business and production practices fully comply with European aviation regulations related to the maintenance of aircraft heat exchangers,” says Denis Yelnikov, TAT Engineering’s general director. “The EASA [endorsement] praises the credentials of the staff and the high level of production management. Such audits have an overall positive effect on the company in that we get a good chance to once again review the condition of our production lines, uncover any rough edges and remove any shortcomings and rectify them,” he adds. TAT Engineering is currently preparing to scale up its business. The new certification procedures are also underway at Russia’s Federal Air Transport Agency (Rosaviatsiya) and US Federal Aviation Administration (FAA). “Our aim is to become the leading centre for the MRO of heat exchangers in Russia as well as for the entire former USSR region. We’ve gone most of the way. We hope that once we have the FAA certificates, we’ll reach our aim,” Yelnikov points out. The joint venture between S7 Technics (former Engineering Holding) and TAT Technologies re-delivered its first heat exchangers to customers in mid-2017. TAT Engineering’s key customers include S7 Airlines, IrAero, UVT-Aero, S7 Technics Holding. Most recently, contracts have been signed with Alrosa Airlines, RusLine Airlines and Utair Engineering, a helicopter MRO services provider. TAT Engineering’s workforce currently holds approvals for the servicing of 13 different models of heat exchangers. By the end of this year that capability list will expand substantially.